Chocolate peppermint cookie truffles dipped in white chocolate and topped with crushed peppermint candies. I am going to keep this short and sweet today! But I just wanted to take a few quick minutes and wish you all a Merry Christmas, Happy New Year and for my Jewish friends, I hope you all had a magical Hanukkah. Even though this December flew by in the blink of an eye, today I am feeling super humble and blessed. I am so grateful to have spent time with my family over the weekend and to spend time today and tomorrow with loved ones distraction free. It is these moments, spent with friends and family, making memories, that this precious life is all about! I am also so grateful and feel so blessed that I get to do what makes me happy every day and that all of you come back here daily to read my ramblings, try a Kitchen Concoctions’ recipe, and show your love and support. To celebrate today and this magical season… here is one last festive holiday recipe. 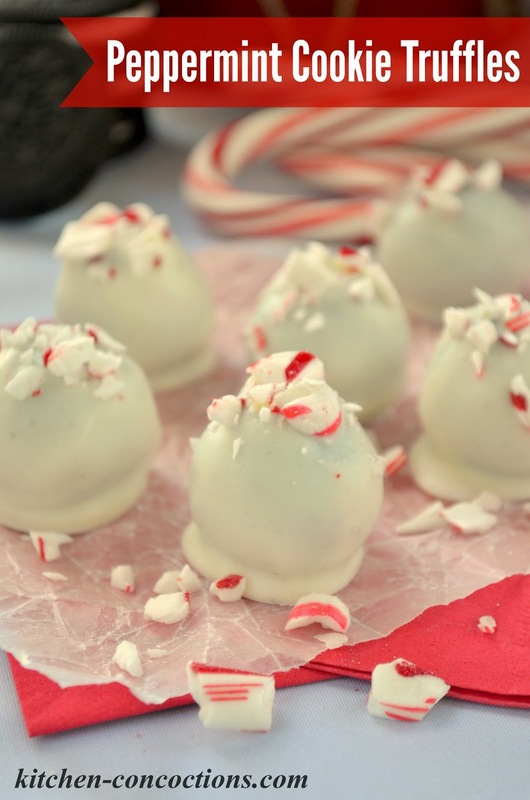 These Peppermint Cookie Truffles are so easy and taste just like the season… magical! I hope you will whip some up today with your loved ones and cherish the life long memories you are making with each other. Place peppermint cookies in food processor. Pulse until finely crushed. Add cream cheese and pulse until well-blended. Line baking sheet with wax paper. Using a teaspoon, scoop dough and shape into approximately 1-inch balls, rolling between palms of hands to shape. Place cookie truffles on prepared baking sheet. Place shaped cookie truffles in freezer and freeze for 30 minutes. Place white chocolate and oil in a microwave safe bowl. Microwave for 30 seconds, stir and return to microwave, heating for an additional 30 seconds. Repeat melting and stirring process until chocolate is melted and smooth. Using two forks dip chilled cookie truffles into melted white chocolate until cookie truffle is completely covered. Transfer chocolate dipped cookie truffle to a new baking sheet lined with wax paper. Working quickly, before chocolate starts to set up, sprinkle the top of each cookie ball with a pinch of the remaining crushed peppermint candies. 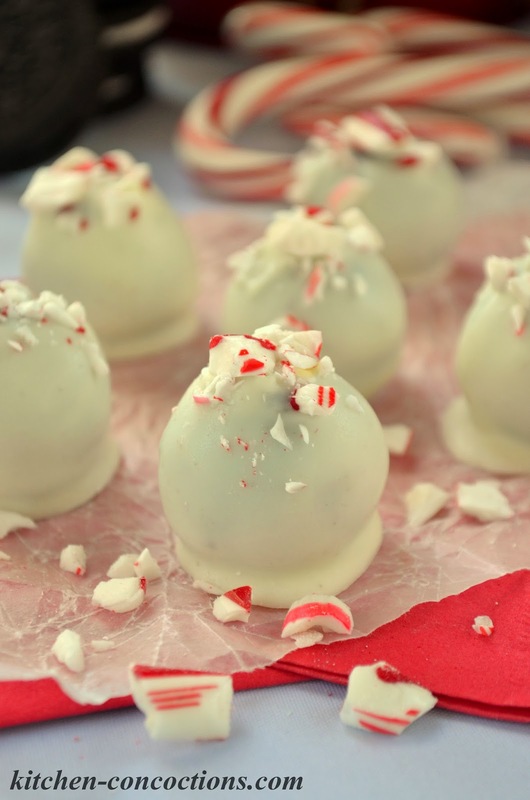 Refrigerate prepared peppermint truffles for at least one hour before serving. Store leftovers in refrigerator. *NOTE: Peppermint extract can be added to the cookie/cream cheese mixture for a stronger peppermint flavor to replace peppermint oil. This really was a magical treat! The consistency was perfect!